Summary: 50 years ago, Earth received a transmission from space, from a group of beings who called themselves the Undying. In their heavily coded message, they not only gave warnings about their civilization destroying itself, but they also gave enticing clues for how to find what they left behind on their home planet Gaia. Now, Earth is dying, and everyone believes that the secret to saving Earth is somewhere on Gaia, after an initial exploration discovered tech that is helping to offset the effects of climate change that have been wreaking havoc on the environment. And with the coordinates of Gaia revealed, EVERYONE is trying to make their way--legally or illegally--to this new planet to try and find what they can. Enter Mia, a scrappy street scavenger who smuggles herself over to Gaia because she desperately needs to find some spoils that she could sell for money. Enter also Jules, an archaeology genius with a burning need for just pure knowledge. Thrown together on an alien hostile planet, they need to work together to find their way through the secret messages and deadly traps set up in the Undying's ancient temple. However, as they progress, they find that perhaps the traps aren't the deadliest thing they will encounter. Thoughts: WOW. WHAT AN ADVENTURE! I knew this would be good, because I loved the Starbound trilogy that Kaufman and Spooner wrote together, but this is some next-level stuff! Unearthed is definitely as described: "Lara Croft meets Indiana Jones IN SPACE!" 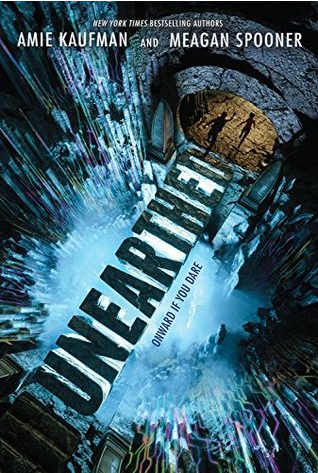 There was so much to unpack, from the Undying's messages, to the nature of humanity, to even just imagining the terrain... it's a wild adventure that really doesn't stop, and when I got to the last page, I wasn't ready for it. It's funny that this story was described in part as Indiana Jones, because I definitely saw Mia as Han Solo--doing whatever she needs to survive, not caring specifically about purity of intent or motive the way Jules, who grew up privileged and sheltered and academic, does. Jules is interested in discovery for the sake of discovery, while Mia is interested in making some money for reasons of her own (that reveal her to be not a purely selfish criminal type). With their different skills together, they make a great team, and seeing them work together is half the fun of the book.